When you have as big a celebrity fan as Stephen King, you must be doing something right! The three-piece from Finley, New South Wales, Australia, often jump genres from disco-pop (Stevie, Calypso) to mutant dance (Arse Huggin' Pants) - in the course of a single album, no less. And yet, they still manage to rock like mofos (Shazam!, Outta My Head, and - of course - their cover of Black Betty). The three band members Mark Maher or "Kram" (drums and vocals), Damien Whitty or "Whitt" on guitar and Janet English on bass/vocals come from the small town Finley in southern New South Wales where they jammed together in their youth. The band moved to Melbourne, Australia where Kram was studying at the Victorian College of the Arts School of Music. The band played its first gig at a loungeroom for a friend's party. The band soon became part of Melbourne's punk scene playing gigs at venues like the Tote Hotel in Collingwood, Victoria. They released their first single Circle K on Au-Go-Go Records with an EP titled P'tang Yang Kipper Bang Uh! following in 1992. The band's first album Shashavaglava was released in 1992. 'Shashavaglava' means 'dickhead' in Croatian. This album featured the songs Old Man Sam and a cover of English comedians The Goodies' song Run. 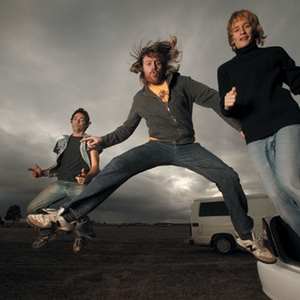 Spiderbait signed with Polydor Records and released their first album with the new label, their second album overall, named The Unfinished Spanish Galleon of Finley Lake in 1995. The album reached #14 on the Australian charts with singles Monty and Jesus receiving extensive airplay on Triple J. The album title refers to an unfinished project by the Finley Rotary Club, which became a venue for teenage drinking in their home town. Their third album Ivy and the Big Apples was released in 1996, reached #3 and sold over 180,000 copies in Australia. Their first single Buy Me A Pony received extensive airplay on Triple J resulting in listeners voting it as their favourite song of the year. The second single Calypso also achieved commercial airplay, and reached #13 in the Australian singles charts in 1997. In 1998, Janet English and her then boyfriend Quan Yeomans of Regurgitator recorded an album as Happyland. Around the same time, Kram and Richie Lewis of Tumbleweed released their own side-project the Hot Rollers - so named as both member's mothers were hairdressers. The Hot Rollers only album (self-titled) was released through Polydor. Spiderbait returned together in 1999 with the album Grand Slam which also debuted at #10 on the Australian album charts. Despite good airplay for the Grand Slam singles Shazam! and Stevie, their 2001 album The Flight Of Wally Funk was a commercial flop, only selling 20,000 copies. The album was recorded in Whitt's living room. Spiderbait recorded the Tonight Alright album in Los Angeles with producer Sylvia Massy who had worked with acts such as the Red Hot Chili Peppers, R.E.M., Tool, System of a Down and Skunk Anansie. The first single Black Betty was a cover version of the old Leadbelly song which became a hit in 1977 when covered by Ram Jam. The single reached #1 after 10 weeks in the singles chart in May 2004 (after debuting at #12), and stayed there for three weeks, becoming their biggest selling single ever. The film clip featured a hot rod similar to the car on the ZZ Top Eliminator. The song also made the soundtrack to the Electronic Arts video game Need for Speed: Underground 2. Tonight Alright was released on 28 March 2004, and debuted and peaked at #14. The second single Fucken Awesome debuted in the top 30 on June 28 2004. Interscope Records signed the band in 2004 to distribute Tonight Alright in the US and UK. At the 2004 ARIA awards, Kram performed as part of the supergroup The Wrights, featuring members of many other Australian rock bands. In September 2005 they released a Greatest Hits collection to reveal their back catalogue to younger fans who were caught up by Black Betty. This debuted at #6 and received a Gold Accreditation. The band went on hiatus March 2005 after bassist Janet English gave birth to her daughter and planned a cycling tour across Europe. More recently Kram had announced plans of a solo album to be released sometime in 2006. On 18 November 2006 the band performed at the Queensland Council of Unions organised Rock the Vote! concert in Brisbane after a nine month hiatus from touring.